June 5, 2008 - Home foreclosures soared to 0.99 percent in the first quarter of 2008, the highest rate since 1979. This latest report encapsulating the mortgage market, released Thursday by the Mortgage Bankers Association, shows mortgages falling into foreclosure from January through March surpassing the previous high of 0.83 percent in the last quarter of 2007. The record high figures are expected to continue rising, a sign of the increasing damage from the housing market collapse. In addition to foreclosures, more and more homeowners are falling behind on their monthly mortgage payments. The delinquency rate, reflecting payments 30 or more days past due, jumped to 6.35 percent in the first quarter of 2008. In the final quarter of 2007, the delinquency rate was 5.82 percent. The rate of late payments also set a record as the highest since 1979. According to the Association, the swiftly falling home prices across the country are the biggest factor for rising foreclosures and late payments. When borrowers run into trouble (divorce, loss of job, other economic difficulties) the impulse is to sell the home. But with today's market, that's increasingly an impossibility. 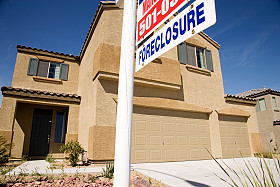 The continuing fall of home prices will mean a continuation of foreclosures and delinquencies. The Association also released figures documenting which sectors of the population were hardest hit. Homeowners with subprime adjustable-rate loans had the most foreclosures and late payments, with 6.35 percent of this group beginning the foreclosure process and 22.07 percent behind on payments. Even prime borrowers are feeling the pain. The percentage of prime borrowers with adjustable-rate mortgages who fell into foreclosure reached 1.55 percent, and the delinquency rate rose to 6.78 percent. Accounting for 89 percent of the total increase in new home foreclosures are those states continually making housing market headlines: California, Florida, Nevada and Arizona. How Soon Will the Fed Reverse Course on Rates?